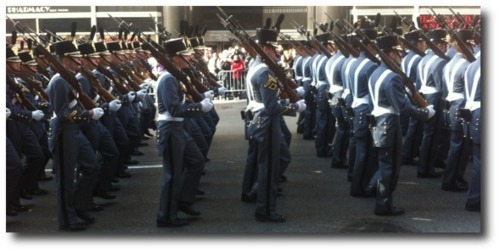 I walked south on Fifth Avenue as an enormous Veterans Day parade worked its way north. Then came New York City firefighters and the red-jacketed bagpipers who play at their funerals. 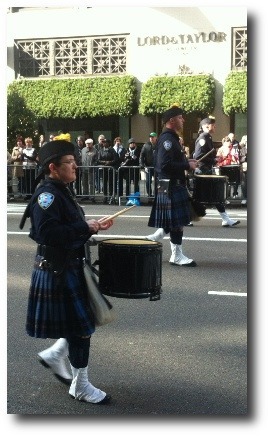 And then emergency medical technicians and their bagpipers. Then it hit me. These men and women risk their lives every day for me. I felt deeply moved, deeply grateful. I walked past re-enactors wearing Civil War dress uniforms, a reminder of war’s terrible price and, now and then, utter necessity. Troops of every kind marched by, active military and veterans. A woman stood quietly holding up a blue sign saying, “Thank you.” Veterans in the crowd waved and applauded. When a float for the families of fallen soldiers went by, a teary-eyed woman on the sidewalk waved and smiled. I saw high school bands, military bands, ROTC groups, soldiers driving vehicles from various wars. I realized that we aren’t a militaristic nation. Generals and admirals don’t rule us; a civilian is their Commander in Chief. Troops don’t invade our homes. Yes, our politicians lead us into questionable conflicts and then stay safely out of harm’s way. But we the people are less enthusiastic about military adventures. Willing to serve, but not lusting for it. The mood today on Fifth Avenue was one of gratitude.